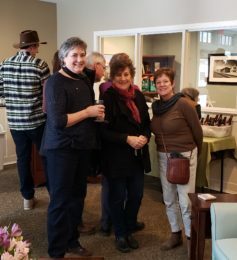 On Saturday, March 2nd we hosted our 7th annual Art at Bartlett Art Reception. Bartlett Woods is pleased to present Mid Coast Legacies in Art curated by artist Pam Cabanas. 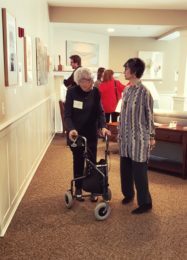 The exhibit looks absolutely beautiful and the artists were very pleased says Mary Eads, Executive Director at Bartlett Woods. The gallery styled showing hosts individual family exhibits featuring family bio with pictures of each artist. There was a lot of excitement in the air, many guests commented that they had never seen an exhibit of this kind and thought it was a really wonderful idea. The stories are remarkable and so interesting to read. We had about 130 attendees which included the artists, and our friends from the community. Chef Aaron offered multiple delicious small appetizers. The mini lobster rolls, scallops with homemade bacon jam, and the crab stuffed cherry tomatoes where among the favorites. Everyone enjoyed music by the Extension Chord, a teenage jazz trio from Camden. The exhibit is open during regular business hours through June 2019. Everyone is welcome to stop by and see this stunning show. Please stay tuned for more information on Mid Coast Legacies in Art – part II coming this summer. If you are interested in participating, please contact Pam Cabanas at pamcabanas372@gmail.com.